The better children can hear, the more they are able to learn.1 This is precisely the premise of the IMPROVING CLASSROOM ACOUSTICS (ICA) project. Listening Opportunities for young children are often compromised when they are subjected to less than optimum acoustical educational environments. This is particularly disturbing because young children spend 45% to 60% of their school day involved in the listening process.2 Among the most devastating acoustical barriers are internal and external classroom noise, reverberation, speaker-listener distance, and poor acoustical treatments in the classroom. For maximum learning to occur in the educational environment, the teacher’s voice must be highly intelligible to all children.3 This is vitally important for young learners with less sophisticated language systems. Over the past 15 years research has shown that FM soundfield amplification is an effective way to produce significant change in students' listening behaviors and academic achievement. 6 An FM soundfield system is a miniature public address system that allows the teacher’s voice to be amplified approximately 5 to 10 dB above the classroom noise level. This brings the teacher's voice to all, amplified at approximately the same intensity level. In addition, FM soundfield classroom amplification is a low cost means to improve the listening and learning environment for students and teachers. It is a method of controlling one very important variable in the classroom environment - the intensity of the teacher’s voice. The FM soundfield system helps all of the students some of the time and some of the students all of the time.7 The benefits of FM soundfield amplification are numerous. The IMPROVING CLASSROOM ACOUSTICS (ICA) special project was designed to determine if students' listening and learning behaviors and skills improved as a result of an enhanced acoustical environment when using FM soundfield classroom amplification. The project involved 2054 students in 94 kindergarten, first, and second grade general education classrooms in 33 elementary schools in Florida. FM soundfield amplification was provided in the 64 experimental (amplified) classrooms and the remaining 30 classrooms served as control (unamplified) classes. Observation data on 1850 students was analyzed to determine if the FM soundfield classroom amplification produced significant changes in students' learning behaviors and skills. Hearing screenings were performed on 1252 students involved in the ICA continuation project. Information from the evaluations is reflected in the following Summary of Results. A more detailed description of these evaluations and their respective findings may be found in the Project Reports. In summary, 1221 students, 55 general education classroom teachers, 630 parents, and 27 school administrators completed evaluations. Students in early grade general education amplified classrooms demonstrated significantly greater change in listening and learning behaviors and skills and at a faster rate than their grade-alike peers in unamplified classrooms. Younger students showed the greatest improvement in listening and learning behaviors and skills. Unoccupied classroom noise levels (M = 47.48 dBA) exceeded the recommended acoustical standard of 35 dBA for 96.67% of classrooms in the ICA continuation project (N = 60). Unoccupied classroom noise levels and acoustical treatments in elementary classrooms have not changed over the past decade. FM sound-field amplification provided teachers with an average increase of +6.05 dBA to +8.67 dBA in vocal intensity (M = +6.94 dBA). Students gave a positive evaluation for the use of FM soundfield amplification (N = 1221). More than 95% of the students agreed that the FM soundfield system made it easier for them to hear their teacher, help them listen better, and helped them to hear when their teacher was writing on the board. At least 94% of students agreed that their teacher's voice was loud and clear when using the FM system and at least 92% agreed that they wanted to use the FM system in their class again the following year. Teachers were in 100% agreement that the FM system enabled their voice to reach all students no matter where they were seated (N = 55). Teachers also were in 100% agreement that they enjoyed using FM sound-field system in their classrooms. Teachers were in at least 92% agreement that they experienced less emotional strain and fatigue during teaching and the need to repeat directions and information decreased when using the FM soundfield system. They were also in at least 92% agreement that the FM system was easy to use, they felt comfortable using it, and would like to use it in their classroom again the following year (N = 55). 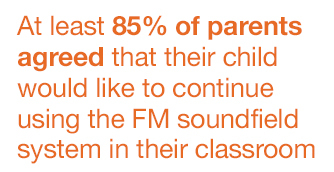 At least 85% of parents agreed that their child would like to continue using the FM soundfield system in their classroom the following year and at least 83% agreed that their child enjoyed using the system (N = 630). Parents were in at least 46% agreement that their child's grades improved when using the FM system and at least 44% agreed that their child's behavior improved at school when the FM system was in use (N = 630). School administrators were in 100% agreement that teachers seemed to enjoy using the FM soundfield systems (N = 27). There was at least 92% agreement by school administers that the FM soundfield system enhanced class instruction and management (N = 27). School administrators were in at least 53% agreement that there was a decrease in the number of behavior referrals from amplified classes (N = 27). Correlation's are strong (.788 to .837) for the Listening and Learning Observation (LLO) and the Evaluation of Classroom Listening Behaviors (ECLB) observation instruments developed for the project, suggesting that they are sensitive tools for observing students' listening and learning behaviors. FM sound-field amplification is a cost effective instructional delivery equipment based on a $0.14 daily cost per person for a typical class (1 teacher and 25 students). The cost would decrease to a $0.03 per person daily rate by adding a minimal five-year longevity factor. 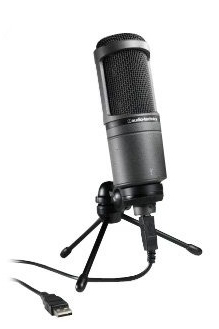 The microphone helps me hear better because my teacher has a soft voice and you can't always hear her. When my teacher turns off the speakers we cannot hear that good. It helps a lot of people who sit in the back and can't hardly hear without the microphone. Our teacher lets us read with it and that's good for shy people. When other kids tell stories to the class we can all hear real good. The speakers make us all pay attention better than we used to last year. I hope we get to have it in our classroom next year to hear better some more. Students could hear and understand better. The system encourages shy children to speak and share information in front of the class; it builds confidence in all students when they use the microphone. It helps students when they use the microphone. It helps students follow directions and enhances listening skills, especially low ability students. More seating options are available to students with hearing loss. It decreases teacher's voice problems, reduces vocal strain, produces a more relaxed feeling when teaching, and teachers feel less tired at the end of the day. It improves student attention; the system assists in getting and holding student's attention. It is an effective tool for chalkboard writing, giving tests, and playing tapes in class. Everyone benefits by using the FM system in the classroom. Every class should have one. It improves the student's ability to hear the teacher more easily and clearly. It improves the student's ability to understand the teacher more easily. It increases self-confidence when students use the microphone in front of the class. It improves the attention and focus of students. It improves the student's ability to hear the teacher from any location in the room, when writing on the chalkboard, when speaking softly, and above classroom noise. It improves student’s ability to concentrate and ignore classroom noise. Students enjoy using the FM soundfield classroom amplification system. Every classroom should have one. It saves the teacher's voice and they are less fatigued at the end of the day. Students could hear the teacher equally as well from any point in the classroom and were able to hear the teacher clearly at all times. Students seemed to listen better. Students seemed to focus more quickly and consistently. Students were more in tune with the teacher. Students like using the amplification and felt important. Class time was saved because instructions did not have to be repeated.